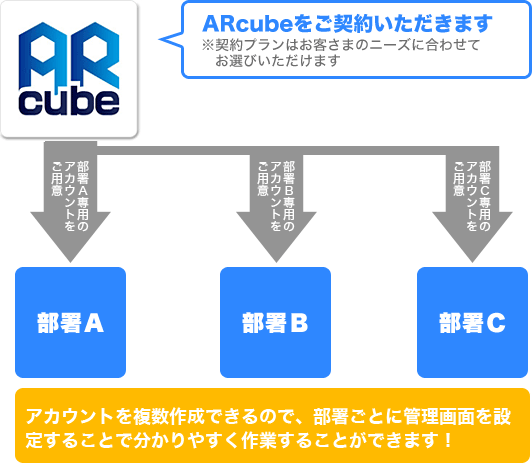 ※"ARcube®" is the registered trade mark of PRAGE Inc.
An operation manual for the admin page will be sent to you after contracting. Besides, we will provide you support through telephone, mail or on-site service. We provide easy-to-understand admin page for you to use AR on your own. Only 10 seconds with your markers and contents! Quickly change your pictures to AR! You can easily set your logo or the pictures or packages of your products on your catalogs or pamphlets. You do not have to print any QR code on them. No cost while changing/updating your contents! You can change your contents on your own at the admin page on the cloud. Quickly update your contents without any cost. 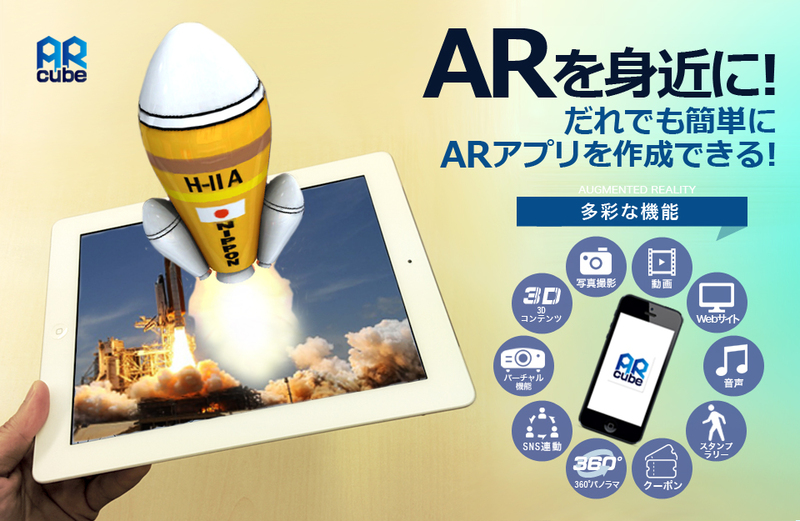 Lowest initial cost for AR application! 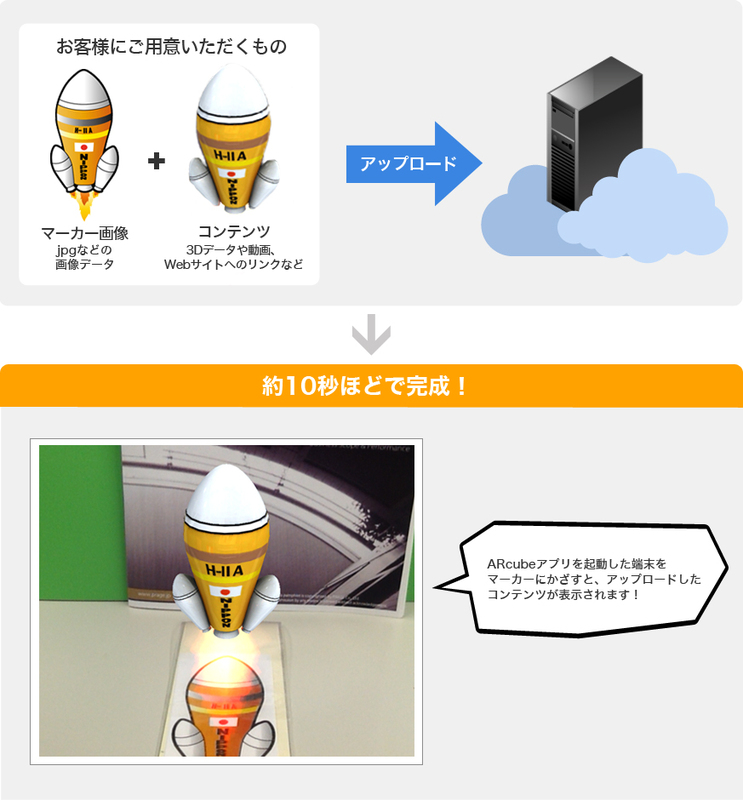 Before, you had to spend more than 1.5 million JPY to build your own application. Besides, the monthly rental fee, maintenance fee and renewal fee of the server are extremely high. With our cloud-based program, the initial cost can be reduced. Feel free within the space limitations! You can use it for your own, or provide it to your customers as a service! You can freely create different accounts within the space limitations! * Generally for 6-month or longer contract. * While changing plans after contracting, 50,000JPY will be charged as renewal fee. * According to in-company investigation in June 2014. Download the application for iPhone&iPad or Android for free. Start your AR life soon after your registration! ARcube can be released as your own application. For those who want to build applications with AR but have no time and money, why not contact us! You can use your own icons and logos. You can create multiple accounts for the admin page for uploading AR markers and contents. 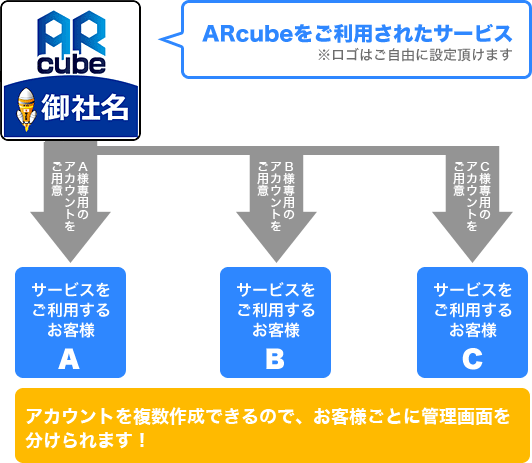 You can provide ARcube for your customers as your own service or manage your AR contents by departments or usages within your company. You can not only upload and edit your contents and accounts, but also analyze your contents. With the analysis of content access, you will be able to promote more effectively! Copyright (C) 2001-2015 PRAGE Inc. All Rights Reserved.